StarWars Force Arena: 2.4 Update Details Count Dooku and General Kenobi is here! ■ New Legendary / Unique Cards Added! 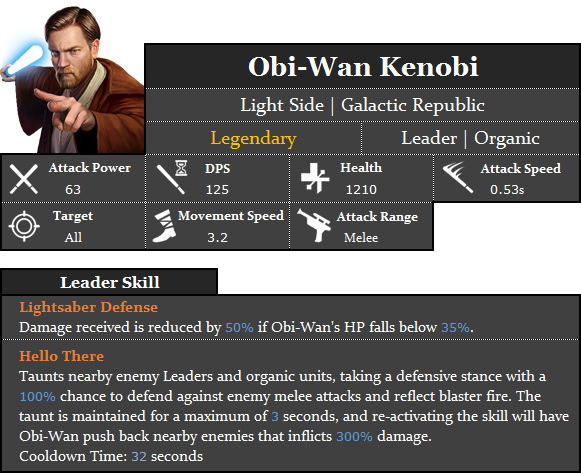 - [Galactic Republic] Added 'Legendary' Card 'Obi-Wan Kenobi'. 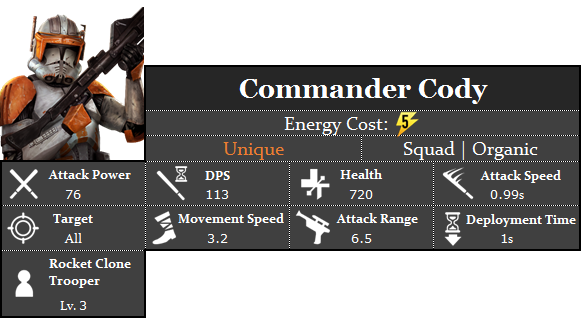 - [Galactic Republic] Added 'Unique' Card 'Commander Cody'. - [Separatist] Added ‘Legendary’ Card ‘Count Dooku’. 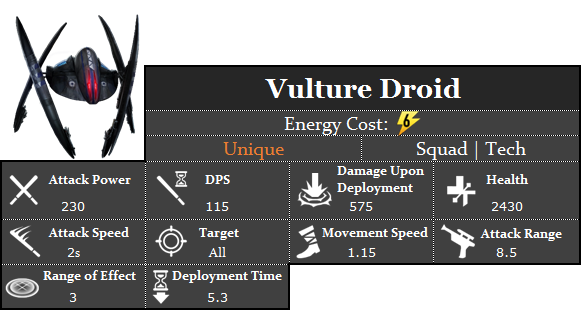 - [Separatist] Added 'Unique' Card ‘Vulture Droid’. - Obi-Wan Kenobi and Commander Cody can be unlocked upon reaching Tier 7 (Bronzium) in the Light Side. - Count Dooku and Vulture Droid can be used unlocked upon reaching Tier 7 (Bronzium) in the Dark Side. - The details of each new card are based on Level 1. - Details are subject to change and we will inform you of any changes. Obi-Wan Kenobi is one of the greatest Jedi in history. His understanding of the Force and his dedication to the Tenets of the Jedi Order are exceptional. Obi-Wan can provoke enemies to attack him so that friendly units can continue to push and take victory. Obi-Wan can also use the Force to push back enemies and deal damage. ▶ Uses his skill, ‘Hello There’ to taunt nearby enemies while defending against melee damage and deflecting blaster attacks. ▶ Cannot be used to defend special attacks such as Zabrak Assassins leap. ▶ If the skill ‘Hello There’ is over, you can reactivate the skill to emit a Force blast, knocking back enemies. ▶ When Obi-Wan Kenobi drops below a certain amount of Hit Points, Lightsaber Defense activates reducing incoming damage. CC-2224, also known as ‘Cody’, is an outstanding commander of the Republic Army. A natural strategist, he is incredibly useful against enemy fortifications or vehicles by calling in powerful Rocket Clone Troopers. His excellent judgement and loyalty will bring victory to the Light Side. ▶ When he encounters enemy buildings or ground vehicles, he will summon a Rocket Clone Trooper and will attack together. Count Dooku was considered one of the top duelists of the Jedi. However, he became disillusioned with the Jedi Council and their involvement in the Republic. Wanting change, he sought ways to bring back the glory days, but instead, found himself succumbing to the Dark Side of the Force. His sophisticated fighting style and powerful use of the Force make him a force to be reckoned with. ▶ When using the skill, ‘Lightning’, Count Dooku will root himself and deal a continuous stream of lightning. Damage of the skill will increase over time. ▶ Count Dooku’s expert duelist ability allows him to use the skill ‘Counterattack’. This will let him counter incoming melee attacks with a certain chance. The Vulture Droid is a powerful tool in the Separatist arsenal. The Vulture Droid is controlled by a central computer, and after its bombing run, will transform into a walking machine capable of inflicting massive damage to the Galactic Republic. ▶ Bombs a small area with high powered explosives. ▶ After the bombing, the Vulture Droid will find a safe place to land and continue fighting in ground mode. ▶ In ground mode, the Vulture Droid will attack enemies with blasters at long distances. We are also making a few changes to the balance of some of the current cards in the game. Numbers and figures in the list below are based on level 1 characters. Princess Leia currently has a slightly lower selection rate compared to average. The development team have determined that her special ability to increase the movement speed of her troops is not very helpful in the current meta-game. We have modified her special ability to better suit her for today’s environment. The Unstable GNK Droid was one of the Light Side’s staple Card, specializing in taking down towers. However, as new cards have been released, the need to use this card has been reduced. The development team hope that the changes will help bring the Unstable GNK Droid back into the decks of Light Side users everywhere. The Grand Inquisitor is a powerful Dark Side leader, with the concept of being one of the best Jedi Hunters. However, as new Leaders continue to be added, his battle performance has dropped compared to the others. The development team decided to change his special ability so that he once again can be one of the more powerful Leaders. Zabrak Assassins is a Card created to assassinate major targets by entering into stealth mode towards the enemy territory. However, they were very difficult to use because they lacked the ability to distinguish their targets. The team decided to improve them by making them faithful to their original design. - The damage calculations for some units have been fixed. The units will not perform differently, however, they will now show a more accurate damage number in the information window. 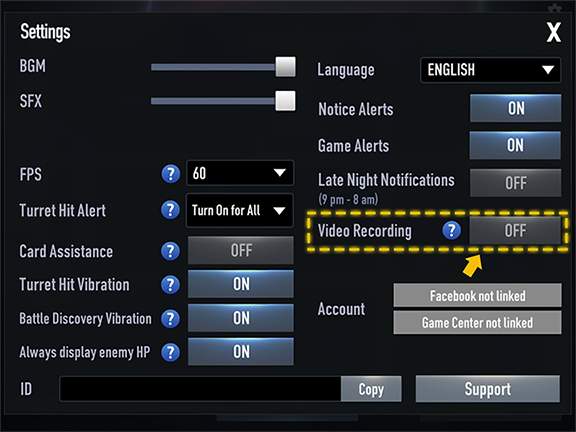 ■ Mission Update Notification Function Added! New notifications have been added to help you check your progress on current missions! You can now check the progress of your missions without going to the mission tab. 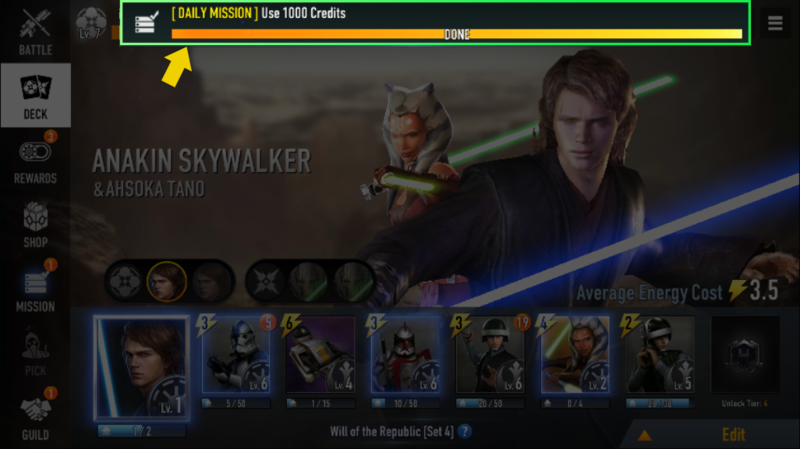 * Light Side / Dark Side Missions, Daily Missions, and Limited Special Missions are in this feature. * The notifications for missions will show when the mission completion status is over 50%. * You can check the mission type and completion status. * In case of participating in other activities like battling or shopping, this notification feature will not appear until the following task has ended. * In case of multiple missions finished at the same time, a single notification will be displayed. * Notification UI can be dragged upward to be removed. There have been a lot of guilds created for Star Wars™: Force Arena. We have heard that some Guilds have not been appearing in the Recommended Guild list. Before, only new Guilds were displayed. Now, it will include other active Guilds as well! We have adjusted the Recommended Guild list so that both new and active Guilds appear in a certain percentage of the referral list. For a more effective training that can improve essential elements for any battle, the Tactical Challenge mode has been improved! 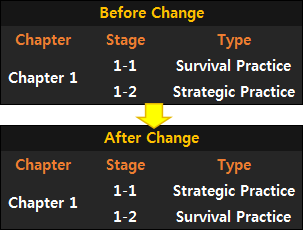 Also, the stage order has been changed to make sure the difficulties of the survival practices is rightly ordered. 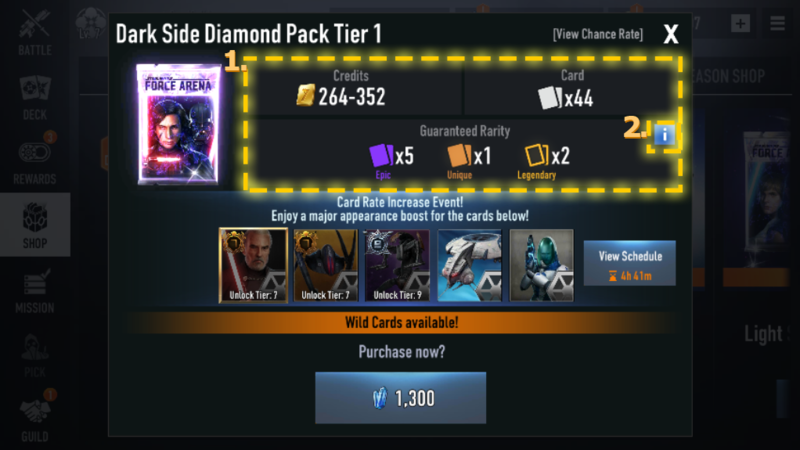 The UI of the Card Packs sold in the Shop that shows the details per pack have been improved! Get information about credits, cards, and guaranteed rareness. Tap on the [i] button to check the probability of acquiring a Wild Card per rarity. You can view the card acquisition information for each product by Tier. In the Unit preview, BB-8’s special ability and health UI of units with shield health have added. In the Field Training, an Invincibility / Infinite Energy icon description text has been added. * You can check the text by tapping the corresponding icon during game play. Video recording function has been added. * Not available on AOS devices, and will be available soon. * iOS devices using iOS 9 OS or less cannot use the video recording function. Matchmaking system improved for Squad Leaders in Tier 9 – 11 being matched with other users with a large Tier gap. Nickname creation time has been changed. Before: Nickname created during tutorial. * At the end of the tutorial, the Nickname is GUEST (number).